Blessed Margaret Ball, nee Bermingham, originally from County Meath, was married at 16 to Bartholomew Ball, a rich merchant, Alderman and Lord Mayor of Dublin. 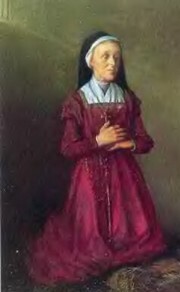 She was imprisoned for teaching Catholicism, harbouring priests and having Mass in her home. This old lady of gentle birth died in the harsh conditions of Dublin Castle in 1584. The Act of Supremacy passed by Parliament in 1536, declared Henry VIII to be the only supreme head of the whole Church of Ireland. From then on, anyone asserting the authority of the "Bishop of Rome", or even assisting those who were loyal to the Pope, could be put to death. Her son, Walter Ball, was a man with political ambition to follow in his father's footsteps and become Lord Mayor of Dublin. He was prepared to renounce his Catholic faith and take the Oath of Supremacy. In 1580, upon instalment as Lord Mayor, he had his mother and her confessor arrested, paraded in a cart before the people of Dublin and thrown in prison. Above is the portrait of Margaret hanging in the Church that bears her name in Swords, Co. Dublin. She was declared 'Blessed', along with 16 other Irish Martyrs, by our late Holy Father, John Paul II in 1992. Bl. Francis Taylor was born in Swords and elected Mayor of Dublin in 1595. For his Catholic faith he was imprisoned, and died, after seven years of harsh prison regime, on this day 1621, aged 70. 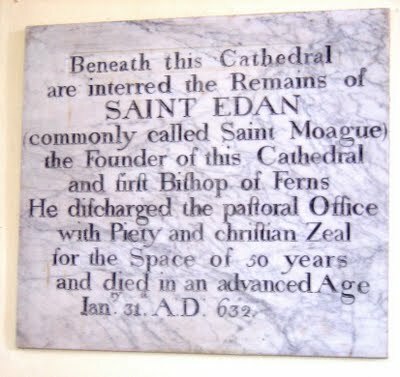 St Aidan, or Maedoc (Mogue), was born around 550, probably in Co. Cavan. Studied under David in Wales, returning to found a monastery in Ferns, where he became bishop in 598, a year after St Augustine - Link- was sent to Canterbury. An inscription on the cathedral wall at Ferns says he died on 31st January, 632. Aidan was renowned for his generosity and kindness as his Lives attests. and to preach the Good News of Your Son, Jesus Christ. As we celebrate his feast, we give thanks for his witness and teaching. 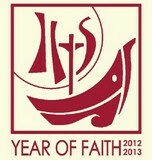 and remain loyal to the tradition of our faith. I ask You to listen to and grant my prayer and request . . .